This region is one of the most important tourist destination in the world. The regional cuisine and red wine are really popular not only among cooks. 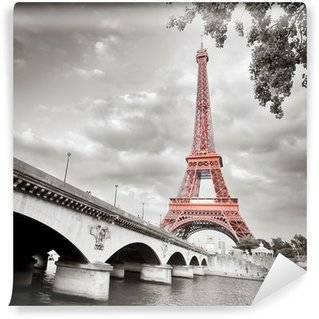 There is also a lot to see: world famous monuments and museums attract visitors from all over the world. Thanks to the mild climate you can visit this place through the whole year! Vinyl Wall Mural Toscana, paesaggio. The most recognisable part of Tuscany is connected with wineries and the wine production. Here you can taste the most delicious wine in the whole world! 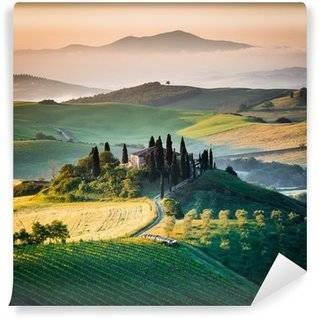 That is why a big part of Tuscany wall murals category is connected with wineries. You can decide to choose a photo of the romantic winery, with brick walls covered with the ivy, wooden window frames and pots full of colourful flowers. That type of decoration will introduce romantic atmosphere to your bedroom or living room. They will look nice in a restaurant or the café as well! Here you will find also shots of fields with grapes which present themselves really nice in the Tuscany sun! We are sure that you will feel the need to taste the wine immediately! When we think wine, we also think about the specific process of its production. That is why in this category you will find charming photos of wooden barrels with wine which waits many years for the moment of tasting! Such amazing decorations will look nice in the kitchen or in your restaurant! However, Tuscany is not only about the wine! Here you will find a lot of wall decorations connected with olives and oil because in Tuscany you can buy the best olive oil! Would you like to have such decoration in your kitchen? It is impressive! What is more, it will look amazing in all type of restaurants as well. Really suggestive! But Tuscany is also about old narrow streets, where you can sit in front of a café and drink some espresso while looking on the passers-by. Wall decoration with cobblestone streets will introduce some specific atmosphere into the room. 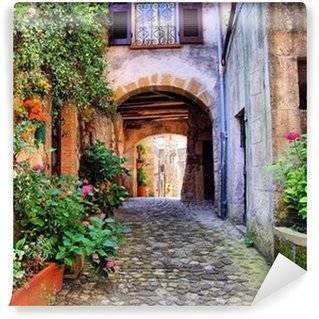 Shots of the San Gimigano Gate or yards filled with the ancient architecture make you want to go there! If your house is decorated in accordance with nature, you will be amazed by the photos of rustic decorations that you can find on the streets of Tuscany: old pots painted white filled with red roses, white doors of the small house in the centre of the market. 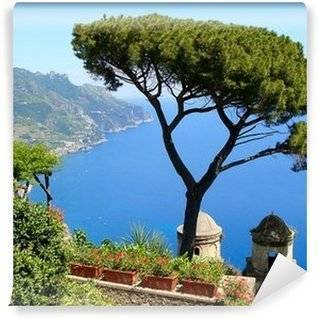 Those wall decorations will bring Italian spirit into your house! Tuscany is seen as the centre of the Italian tourism. Here you can meet everything that is important to that country: tasty food, good quality olive oil and amazing wine, wineries, romantic streets and fields of grapes. Choosing decorations inspired by this country will help you to introduce the romantic atmosphere into your house. They can be used in your restaurant or the café to stress your interests and source of your inspiration.